Have you ever looked at other artist’s paintings of flowers and wished that you could paint like them? You’ve tried, but just could not get the quality that they produce. What’s their secret? How do they do it? You have books in your private library that have wonderful paintings of flowers in all different styles. You’ve got some of them right, but those realistic ones with the WOW factor just seem to be beyond your reach. Well, not any more! Let me take you by the hand into my studio and look over my shoulder as I show you just how I paint them. Let me show you the steps I take and the methods I use to produce the paintings you see in this course. This course is produced primarily for artists who have some experience, but that does not stop the beginner, who is keen, and has the gift of patience, from joining in. I have chosen 4 different types of flowers that need different techniques – techniques that when you master them you will be able to use with virtually any other types of flowers. Excited! Great! I will only be too glad for you to join me in my studio. I’m waiting at the door to welcome you in. You will start week 1 of the course by learning the basic concepts required to paint realistic flowers. 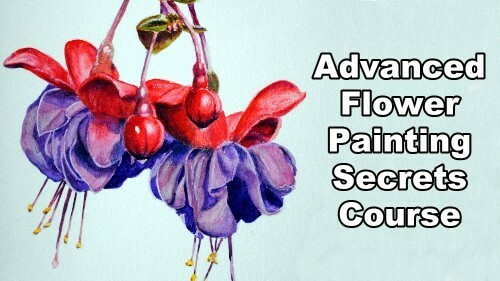 You will learn what equipment you will need as well as the techniques used to turn ordinary flower paintings into incredibly beautiful realistic ones. 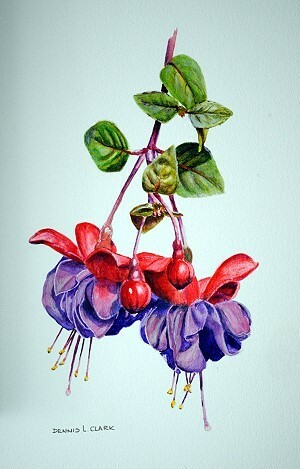 As part of the process you will complete a bunch of fuchsias. 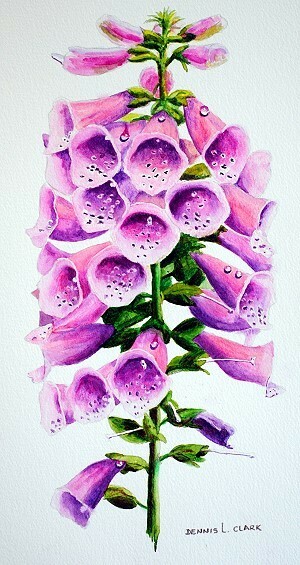 During week 2 of the course you will learn how to paint repetitive objects like the foxgloves quickly without giving up on the details. You will learn how to shade beautifully smooth using watercolour as well as how to make it look as though you can see into each glove. Flowers always look special with water drops on them so you will learn how to do that in this class. In week 3 of the course we will crank up the difficulty another notch by painting a realistic rose as you are now well used to the basic techniques. In this lesson you will learn how to curve and flow petals as well as how to show sunlight reflecting off the leaves as this always adds an extra dimension of realism to a flower painting. In week 4 of the course we wrap things up by painting one of the most difficult flowers of all – Anthuriums (also called Laceleaf). What makes them so difficult to paint is their super smooth and reflective surface. In this class I will show you how to overcome these hurdles in order to paint them effectively. 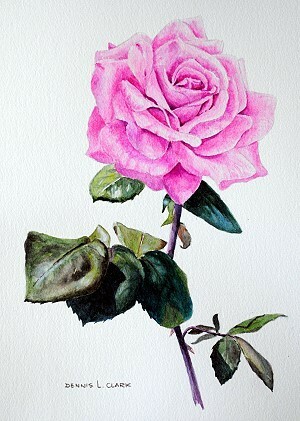 By the end of the course you will be confident in your ability to paint ANY flower realistically using watercolour.